There are 7 notes in carnatic music - they are s, r, g, m, p, d and n. These are also called sapthaswaras (saptha means seven , swaras mean notes). Every song has a shruthi (pitch) in which it is rendered. This shruthi is comprised of 3 notes - either s,p,s (for panchamam-based shruthi) or s,m,s for madhyamam-based shruthi. Interesting enough, amongst these 7 notes, the s and p do not have any variation. The other notes have either 2 or 3 variations. Given below are all possible variations for all the carnatic notes. Figure 1: Keyboard mappings for swaras (I am assuming that we will start 's' with 'C'; oru kattai). When providing songs in carnatic notes, the current octave is specified as s, r, g, m, p, d, n (in lowercase letters). 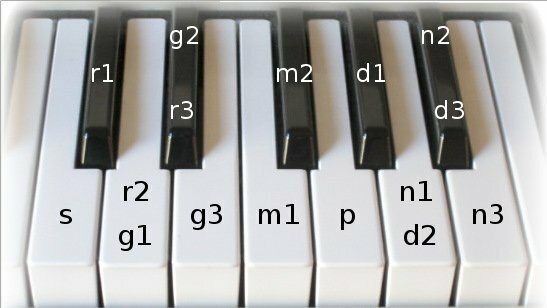 The notes in the next higher octave are depicted as S, R, G, M, P, D, N (in uppercase letters). The notes in the previous lower octave are depicted in lowercase letters with a '.' under the note. There are 7 notes in western music (very similar to carnatic notes) - they are C,D,E,F,G,A,B. Interesting enough, within an octave (12 consecutive keys), there are 7 white keys but only 5 black keys. Given below are all the western notes depicated on the keys. Note that the western notations have almost the same pattern as the carnatic swaras. 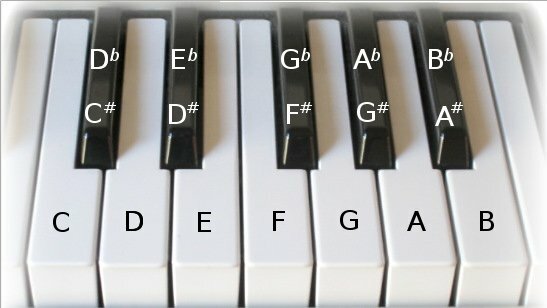 We have the basic notes C, D, E, F, G, A, B (like the s,r,g,m,p,d,n) but these are all the white keys. Now the black keys are specified by either a '#' (pronounced as SHARP) or a 'b' (pronounced as FLAT). A black note immediately to the right of the white key is considered a sharp note for the corresponding white key. For example, looking at the above picture, the 'C#' is the immediate (note: only adjacent) black key to 'C'. Thats why its called C# (pronounced as C-SHARP). That same black key (C#) can also be called as 'Db' (pronounced as D-FLAT). The explanation is the same as the sharp, the flat key is the immediate left black key for the corresponding white key with which they are associated with. Basically, the point to understand is that C# and Db both point to the same key on the keyboard (its the black key between C and D). Its just a matter of convenience. You can call it either way whichever is convenient to you (somebody's SHARP or somebodyelse's FLAT). When providing songs in western notes, the current octave is specified as c, d, e, f, g, a, b (in lowercase letters). The notes in the next higher octave are depicted as C, D, E, F, G, A, B (in uppercase letters). The notes in the previous lower octave are depicted in lowercase letters with a '.' under the note. Music is a sequence of notes in some well defined (or may be random) order. A 'note' is a sound in a specific frequency. Its the frequency of the notes that make them different. So, what are the frequencies of these notes C, C#, D, D# etc? They are well defined and remain the same. The 'A' key on the piano or keyboard is always 440 Hz (its used as an index, sort-of). Its a universal constant. n is the key number from the base key for which we need to find the frequency. Fn is the resultant frequency of the 'n'th key from the key with BaseFreq. Suppose, you want to calculate the frequency of the A in the next octave, (as you know, since there are 12 keys in the octave) there are 11 keys between the current octaves 'A' and the next octave's 'A'. Which means, now our 'n' should be 12. F12 = 440 * 2^(12/12) = 440 * 2 = 880. It is very evident from the above that the same note (in our case 'A') if played in the next higher octave, sounds a frequency which is double the frequency of the current octave (880 = 440 * 2). The same holds good for subsequent higher octaves and lower octaves (except that previous octaves 'A' sounds with half the frequency as the current one). The point to note in the western notations (depicted in the figure above) is that they dont change. The key specified as 'C' or 'D' will continue to be 'C' or 'D' for their lifetime. Thats the way they have designed/defined the western notes on the keyboard. When it comes to playing classical carnatic swaras (like s, r, g, m, p, d, n), since we associate the 's' with 'C', we play in 1-scale. We can also associate the 's' with a 'D' on the keyboard. In that case, our mappings will change for the swaras on the keyboard and we play in 2-scale. Typically this is what dictates a 'sruthi' (the base) for any song (whether vocal or instrumental). You must have heard singers being low-pitched or high-pitched. Low pitched means their 's' will be mapped to either 'C' , 'C#', 'D', 'D#' etc., (mostly in the 1 to 3 scale). Male singers usually are invariably low-pitched. The female singers on the other hand are high-pitched (mostly 4-scale, 5-scale, 6-scale like F, G, A, etc.,). But dont worry! Our notations are always going to be in C-scale (for western notes) or 1-scale (for carnatic) to keep it simple.